Fearless woman completes the trek in 24 hours and 15 minutes. GRAND CANYON, AZ, USA, October 8, 2018 /EINPresswire.com/ — Paralympic cyclist and blind multi-sport athlete Shawn Cheshire is now a Guinness World Record holder. 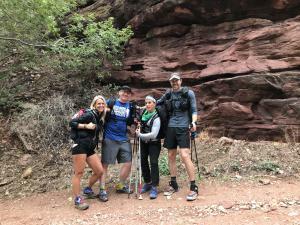 This fearless woman completed the roundtrip trail crossing of the Grand Canyon (Rim to Rim to Rim) in 24 hours and 15 minutes. While her powerful conviction lead her to believe successful completion was inevitable the multisport athlete acknowledges the difficulty of the trip. “The challenge is that because I can’t see, I need to stay 100% alert to verbal instructions during this kind of trek. I can’t coast even for a moment. I did and twisted my ankle and tumbled, injuring my knee. Fortunately, it wasn’t too bad. I was able to finish,” stated Shawn Cheshire. 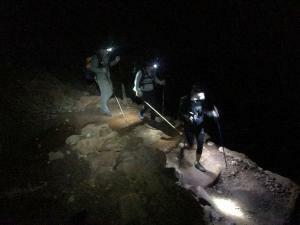 The Rim to Rim to Rim Crossing of the Grand Canyon began Sunday, October 7, 2018 at 12:00 AM and was completed at 12:15 AM today, Monday, October 8, 2018. Her support team consisted of Jesse Crandall, Sara Schulting-Kranz and Scott Drum. Shawn and her crew experienced a myriad of weather including rain, snow, heat and cold. Another challenge for the guides was identifying ground obstacles in total darkness with only headlamps. With the help of a hiking cane and one of her guides was in front and one behind, the journey was a success. The Guinness Book of World Records has been contacted so that record for a blind woman making this journey can be chronicled and established. The Grand Canyon is considered one of seven natural wonders of the world. It is 18 miles wide and attains a depth of approximately 6,000 feet. Hiking rim-to-rim (23.9 miles) is considered one of America's most dangerous hikes, causing 350 heat-related rescues in the park every year. No stranger to the Grand Canyon, Shawn Cheshire hiked a much shorter version of the trails earlier this year. She regretfully never saw the Grand Canyon when she had her sight. Her other heightened senses plus the accomplishment doubt bring about a tremendous appreciation of this beautiful natural resource. Shawn endures a rigorous training routine and is a successful tandem cyclist with eleven national titles. Overcoming obstacles has become somewhat routine for Shawn. Shawn filed a lawsuit against the USOC in a California federal court in early July after sustaining a concussion because she was prohibited by the organization from using her seeing eye dog at a mandatory training camp. Shawn and her pilot were unable to race in at least 4 major international races and US Nationals this year due to the severity of the injury. This is one of several acts of discrimination against visually impaired athletes. Shawn Cheshire served in the US Army as a helicopter armament systems mechanic. Following her years in the service, Shawn became an EMT-Paramedic fueling her passion to care for others. In 2009, while working on an ambulance, she sustained a traumatic brain injury which resulted in total loss of vision. When Shawn was introduced to para sports, it was through sports she confronted her blindness and her competitive spirit ignited. For the last three years, Shawn has raced with the US National Paralympic Cycling Team in 20 domestic and 20 international races, including representing the USA at the Paralympic Games in Rio 2016. Shawn is an 11 time US National Champion. A target goal is to compete in the Paralympics in Tokyo in 2020. She doesn’t limit herself to just cycling. She snowboards, cross country and alpine skis, rock climbs, paddle boards, hikes and runs.